Apple just released OS X Yosemite with a big list of new feature set. One of them is the integration with iPhone. 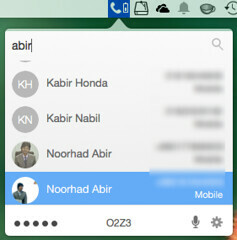 On Yosemite, you can take/make calls from your Mac.using an iPhone. You can answer a call or dial a number when your iPhone is far away from workstation. But what about Android, Windows Phone or any other platform phones? But there is an excellent way to use Apple workstation for make/take phone calls or use as a handsfree speakerphone. Connect is a $1.99 application and available on Mac App Store, does the magic. Connect works with all Bluetooth enabled modern smartphones including Android, BlackBerry and Windows phones. For making calls, you can either dial a number directly or dial someone from your address book. Apart from taking/making calls, the desktop interface will show your your phone’s network signal strength and battery level. Oh! Caller ID also appears with incoming call notifications. In profession I’m a Service Delivery Manager and my phone is very essential part of my job. Bought this app yesterday and life became easy. I wish I could send SMS from this app too. Let’s see what the developers will bring with future updates.